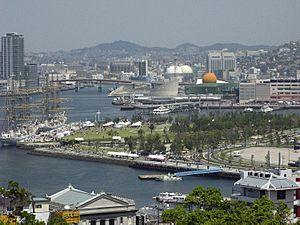 Nagasaki (長崎市, Nagasaki-shi) is the capital city of Nagasaki Prefecture in Japan. Nagasaki is in the southwest of Kyushu. It has been recognized as a core city since 1997. 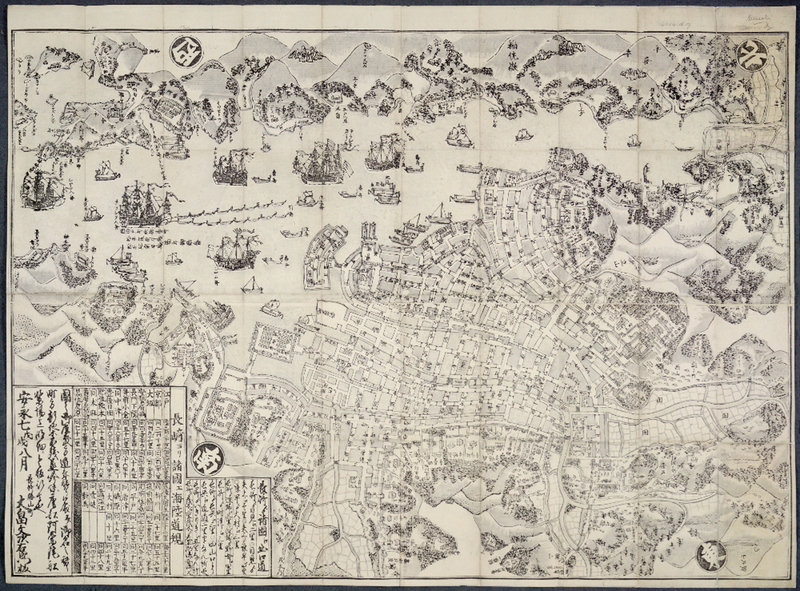 During the Edo period, Nagasaki was the only port in which trade with other countries was permitted because of the national isolation policy (sakoku). In the 1870's, Nagasaki became the capital city of the prefecture which evolved from the former province. 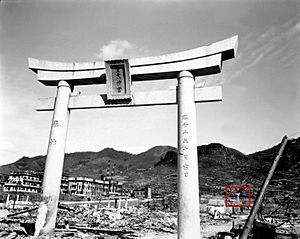 On the day of the nuclear strike (August 9, 1945) the population in Nagasaki was estimated to be 263,000, which consisted of 240,000 Japanese residents, 10,000 Korean residents, 2,500 conscripted Korean workers, 9,000 Japanese soldiers, 600 conscripted Chinese workers, and 400 Allied POWs. That day, the Boeing B-29 Superfortress Bockscar, commanded by Major Charles Sweeney, departed from Tinian's North Field just before dawn, this time carrying a plutonium bomb, code named "Fat Man". 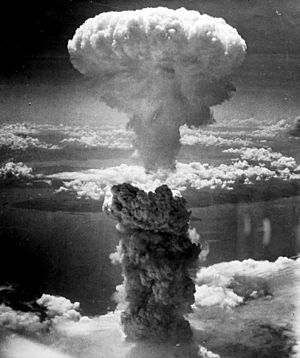 The primary target for the bomb was Kokura, with the secondary target being Nagasaki, if the primary target was too cloudy to make a visual sighting. When the plane reached Kokura at 9:44 a.m. (10:44 a.m. Tinian Time), the city was obscured by clouds and smoke, as the nearby city of Yawata had been firebombed on the previous day. Unable to make a bombing attack on visual due to the clouds and smoke and with limited fuel, the plane left the city at 10:30 a.m. for the secondary target. After 20 minutes, the plane arrived at 10:50 a.m. over Nagasaki, but the city was also concealed by clouds. Desperately short of fuel and after making a couple of bombing runs without obtaining any visual target, the crew was forced to use radar in order to drop the bomb. At the last minute, the opening of the clouds allowed them to make visual contact with a racetrack in Nagasaki, and they dropped the bomb on the city's Urakami Valley midway between the Mitsubishi Steel and Arms Works in the south, and the Mitsubishi-Urakami Ordnance Works in the north. 53 seconds after its release, the bomb exploded at 11:02 a.m. at an approximate altitude of 1,800 feet. Less than a second after the detonation, the north of the city was destroyed and 35,000 people were killed. The city was rebuilt after the war, albeit dramatically changed. New structures were also raised as memorials, such as the Atomic Bomb Museum. Nagasaki remains first and foremost a port city, supporting a rich shipbuilding industry and setting a strong example of perseverance and peace. On January 4, 2005, the towns of Iōjima, Kōyagi, Nomozaki, Sanwa, Sotome and Takashima (all from Nishisonogi District) were officially merged into Nagasaki. Nagasaki Facts for Kids. Kiddle Encyclopedia.